Words can not describe how delicious this chess pie is. After baking, the rich creamy chocolate pie filling has a slightly crisp top. This pie turned out great and was a huge hit. I just had to share it with everyone! I was very pleased to find this old family recipe. Family recipes are sentimental, special treasures. Every time I look at an old recipe card, I vividly remember who that recipe came from and all the wonderful memories. This recipe uses evaporated milk. I talked about how great this stuff is on a previous recipe post: Family Favorite Stuffed French Bread. It really does make a huge difference in the creaminess and richness of a recipe. Start off with a pre-made pie crust (unless you have your own favorite pie crust recipe). Mix the ingredients in a large bowl with a wire whisk until blended well. This mixture will be thin but it’s fine this way. Pour into the pie shell and bake at 350 for 35-40 minutes. Trust me, this pie is spectacular all by itself. But if you prefer to “dress it up” I suggest topping it with powdered sugar, whipped cream or ice cream; you’ve got yourself a winning dessert each and every time. Try adding some fresh strawberries or blueberries as well. Awesome with a glass of ice cold milk! 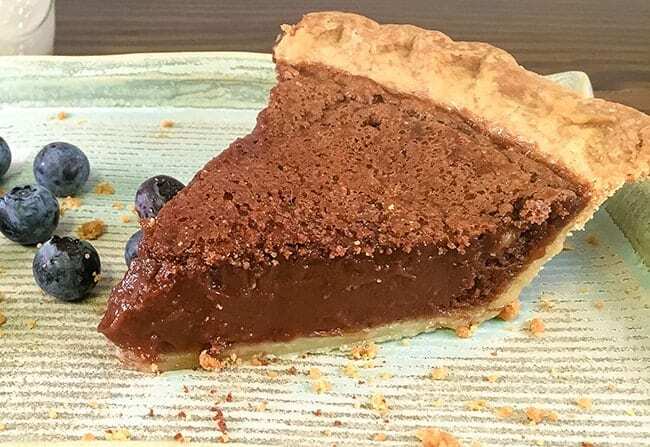 This easy chocolate chess pie recipe is so delicious you’ll become hooked after just one bite. 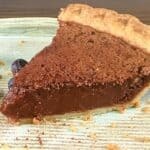 Rich and decadent are the best two words to describe this chocolate chess pie from an old family recipe. Preheat oven to 350. Prick the pie shell a few times with a fork and bake for 5 minutes. Remove from oven. Using a wire whisk, mix remaining ingredients in a bowl and pour into pie shell. Bake for 35-40 minutes. RECIPE NOTE: The pie filling won't be thick before baking; in fact, it will be quite liquidy. This is OK! After the pie bakes and cools, it will thicken nicely. Yum delicious! And so easy! It is very easy and sooo good! Unbelievably delicious! So easy to make.